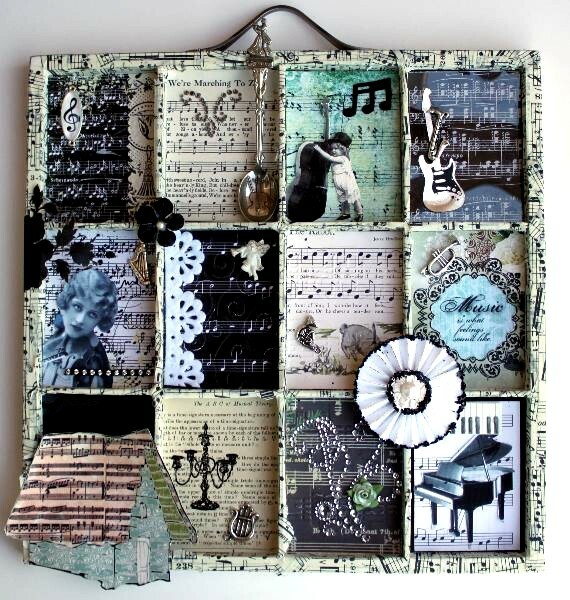 This week's sample is from Electra - a most elegant, beautifully designed collage in shadow box style. Thankyou, Electra, for sharing your artwork with us. My Musical Mayhem is on my blog! My picture is on my blog! Thanks to Electra for her beautiful sample picture. What an amazing amount of work she has put into it. Wow! What a beautiful example... LOVE Electra's example ro us. My entry can be found HERE. What a wonderful sample piece! My entry is on my blog. Thanks for looking! Go check out my MUSIC entry for this week. My musical dancing lady is on my blog, here. Happy New Year, everyone! Hi, just came across this challenge. My entry is on my blog. Thanks for looking! My Garden Music is here. Thanks for checking out my ATC! Bonjour superbe ,j'aime ces partitions et instruments de musique..joli collage.bonne journée .